When the Scottish artist William Turnbull died on the 15th of November last year, it was the end of a life that was as eventful - and at times thrilling - as it was significant to his chosen vocation. 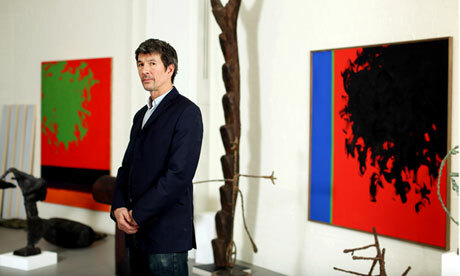 Through his work, he managed to achieve a status as one of Britain’s most influential artists of the last century. Nevertheless it is hard for me now to think of a stereotypical Turnbull piece. Perhaps one of his horse head sculptures; or female standing figures; or his paintings of solid colour dissected by a single line? I tend to think more of the overall thematic treatment and contemplatory nature of his work than of any specific pieces. Most of his work carries characteristics that allow for quiet reflection. The subtle qualities of his creations slowly transfix the viewer; this is the real charm of his work. Often described as sort of ‘timeless’ and archaic – the pieces often seem less of their ‘time’ and more of ‘all time’. I see the overriding emotions they carry as being intrinsic to our sensory human experience. Removed from any specific social and historical context, the work is in a sense native; that is - it is more in tune with indigenous art, than with the ‘other’ more commonly seen representational forms associated with the western tradition. Turnbull’s life reads like something from a classic novel or cinematic narrative. Born in 1922, the working class boy from Dundee would be directly affected by the Great Depression of the 1930s. Having to leave school at 15 to work as a labourer because his Father had lost his job during this economically dire period, he still managed to find a way out of this grinding work and bleak existence. He gained a job at D. C. Thompson the famous Dundee based publishing company (famed for the Oor Wullie, The Broons & The Dandy comic books). Working with colleagues who had been to art school, Turnbull always emphasised the importance of his time spent at Thompson’s on his later career as an artist. He would view this as the start of his art education. This work also seemed pertinent for a man who had had a strong connection with art from his infancy. In fact he had learnt to draw by copying comics and other illustrations as a child. These early fascinations with ‘pop’ imagery and an intrigue in the mass produced popular images of the time, was an experience similar to that of many of Turnbull’s contemporaries. By focusing on popular culture in this way, many artists from this generation would go onto profoundly inform and shape much of the art of the 50s & 60s. Along with Turnbull, some of these artists would later form the now highly important Independent Group of the 1950s. These artists included Eduardo Paolozzi (1924 – 2005), Richard Hamilton (1922 – 2011), and Nigel Henderson (1917 - 1985) amongst others. The group would be integral in heralding in a new and exciting time for British art through their diverse and innovative work. These events would coincide with the emergence of the ICA - the centre for new art in London - and the associated This is Tomorrow exhibition at The Whitechapel Gallery in 1956. Turnbull helped develop and champion what would later be known as Pop through his progressive treatment of forms and the use of new materials in his work, like Perspex and Fibreglass. However his work would be more heavily informed by tribal and Eastern religious art. His marriage to the equally brilliant Singaporean Artist Kim Lim (1936 – 1997) in 1960 (who still hasn’t had anything like the wide recognition in the West that Turnbull has had, which she richly deserves), undoubtedly played a significant role in the direction Turnbull’s work would take and the development of its subject matter. The impact of her culture and their travels together unquestionably played a vital role in this regard. Even though his work and life would change quite dramatically over the decade’s one feature of his practice always remained constant. Brought about by his early fascination with ‘pop’ imagery and through sketching the pictures he found, one aspect of his working method that never changed through out Turnbull’s life, was his commitment to drawing. He would never lose faith in the full realisation of the inherent importance of this activity on the discipline of the artist’s practice. During the Second World War Turnbull served in the RAF. He found that this experience made a profound impact on his perceptions of the world he observed and particularly how he viewed landscapes. He made a visionary discovery when flying his plane. Viewing the world in this aerial way would go onto fundamentally inform his work as a painter. The compositions of the ‘bird’s eye’ views he saw would provide the initial structures for his later expressionistic abstractions. After the War he stayed in London and enrolled at the Slade, but quickly felt disillusioned with the conservative outlook of this institution. His passion for European Art was not in keeping with the Slade’s traditional approach to art education, therefore Turnbull relocated to Paris where he felt far more at home. There he was in his element. He was surrounded by artists who he connected with and who’s modern and progressive work would inspire and shape his own work dramatically. In particular Alberto Giacometti (1901 – 1966) made a huge impression on Turnbull both as an artist and as a person. The textured and ‘animated’ aesthetic Giacometti fashioned, and came to be so synonymous with his work, is an aspect that would come to feature in many of Turnbull’s own sculptures. Whilst watching Alex Turnbull’s charming documentary Beyond Time it became clear to me why his father’s body of work is so important to 20th century Modern Art. Because it was constantly evolving and transforming, it makes the work almost always seem fresh. There is no complacency or the suggestion of a jobbing artist just going through the motions. He practiced both as a painter and a sculptor. Yet his works from both these disciplines hold up in terms of their quality and impact on their respective fields. For many artists working with more than one media it is often deemed problematic. However Turnbull was able to achieve success in both these areas. More importantly though his work still holds together as a coherent statement and one which never wavers from its intention to effect the natural sensory perceptions and emotions of the viewer. He seemed to understand what the purpose of his art was, and although its aesthetic changed fairly dramatically over time, its focus and themes never really did. His understanding of the work and development of the subject matter is crucial in creating this vital body of work. It would seem to me from watching Alex’s documentary and researching Turnbull’s life that his legacy as an artist is of one who was absolutely dedicated to the process of making the work himself. As a practioner Turnbull’s approach was the antithesis to that adopted by the conceptually driven fine art, produced by much of our recent stream of contemporary artists. His work places the emphasis on the artist creating works themselves. This initiative would take precedence over every other aspect of the work’s inception. The ‘idea’ is not Turnbull’s dominant interest. The clever twists and witty statements that have become the norm in today’s contemporary art scene, seem in opposition to the ethos adopted by Turnbull, and many of his contemporaries. Turnbull was an artist who always worked around the same basic core themes and principles. He wanted the intrinsic emotive sensations conveyed by his forms, structures and abstracted imagery to be the principal purpose of the work. The idea of creating something from nothing was an aspect that never deserted him from his earliest times as an artist. The bag of dust that he could fashion into plaster and work into the shapes and forms he wanted would be a fundamental process for Turnbull. Although he moved away from working in this media, his use of plaster was an aspect of his work that he would return to and is now the material most associated with his work. Here was a man who taught himself to weld. When he began working in this way in the mid 60s, he and fellow artist Brian Wall (1931) would weld in the foundry at the Central School of Art where they had both started teaching. Turnbull would also work in his own back garden, toiling and sweating away on his sculptures until he had them welded exactly the way he wanted. There was no chance of him signing off an idea or a drawing, then leaving it to a team of technicians to construct. No, he was both the artist and the technician in that sense. In fact, as would surprise many artists nowadays, Turnbull would not separate these two roles. For him the artist should always play a critical role in the practical creation of their work. In the film we even see a 90 year old Turnbull working alongside the technicians in order to create the exact representations he wanted. From his early years working in Paris, and his time spent viewing Giacometti and Brancusi (1876 – 1957) working in their studios. This central belief of the artist and their studio being the place where all creation comes from - both informatively and practically - is something that never changed in Turnbull’s mentality. This undoubtedly connects with his belief that the artists must draw. For him it is the way in which they are able to make sense of the way they see the world. Drawing always informed his work and is something that he would forever continue to practice. I feel that William Turnbull - like many of his contemporaries - will be remember as an artist that made work which challenged the traditions of art, but was still completely aware of the importance of art’s history on his practice. He realised that one is always a student and that the career of an artist is about learning. This is the key to longevity. The complete body of work one is able to create during a lifetime, is the ultimate achievement of the creative being. The media obsessed, careerist artists, that in the last few decades the art world has become inundated with seem totally at odds with the stance taken by Turnbull et al. For them the creative process was not just about the idea or the rhetoric which reinforces that idea. It is crucially about the artists’ involvement in the making of the work; the execution of their creative vision and the development of their practice over their lifetime. One still tends to agree with the time worn ideas that guided Turnbull. That the artist’s “development” is made far more successful through the use of the same basic principles that have always directed them. One of these fundamentals is that the artist understands their practice through the act of drawing. For me this has never changed and I don’t see it doing so any time soon. Wonderful article about an artist essentially u8nknown to me. Am looking forward to seeing the full documentary. Thanks for the comment and kind feedback; glad you liked the piece. Turnbull really is a great artist, he was never complacent. I hope you manage to get a hold of Beyond Time, it is a good watch.